Incremental advances in understanding the genetics, epigenetics, and biochemistry of aging are gradually pushing the field forward. In addition, there are occasional new ideas that have the potential for quantum advances that change the nature of the game. Last week, there were two game-changers, originating from the US East and West coasts. Caloric Restriction has been the surest and best-documented way to add a few years to human life expectancy, with additional benefits for health and vitality along the way. But few people have the discipline to stick with a restricted diet year after year, and in fact average BMI has been increasing for decades in America and Europe. Valter Longo (U of S Calif) has been promoting the idea that intermittent fasting offers most of the benefits of CR, while demanding less discipline. Last year, he documented impressive benefits from periodic fasting on water for 3 to 5 days. Most people who try this practice compensate when the fast is over, and quickly gain back the weight that they lost; nevertheless the benefits persist. This week, Longo offers us a 5 day diet that induces many of the same benefits as fasting, but need not disrupt anyone’s life, comfort, or energy level. The search for drugs that extend human life has been held back bureaucratically by the FDA’s outdated idea of what a drug is for. A drug can only be recognized or approved if it treats a disease, and aging is not a disease. In fact, there are existing drugs that modestly slow aging (e.g., aspirin, melatonin) but they have been approved on a different basis, for different uses. Nir Barzilai (Einstein College of Medicine) is a respected and well-established researcher who has thrown his reputation behind an initiative to change the FDA’s position. He has designed a drug trial for metformin, the oldest and best treatment for Type 2 diabetes, to determine whether it can slow aging. Of course, a great deal of pre-existing data suggests it will pass this test, and Barzilai will then propose that metformin be approved as a prescription for people not diagnosed with diabetes, as a preventive for cancer, diabetes, Alzheimer’s Disease, heart disease and stroke. Weindruch was well-informed, and what he said was state-of-the-art science in 1996, but today we know better. Restricting protein and restricting particular nutrients have been shown to deliver some of the same benefits as a CR diet; and intermittent fasting has been validated as a life extension program in rodents, with strong evidence that it will work in people, too. It’s a good thing, because sticking to a low-calorie diet is hard for most people. Now Weindruch is approaching retirement and his compatriot Roy Walford left us in 2004. Valter Longo has picked up the mantle of practical CR research where they left off. As I have come to expect, Longo does his homework. The new publication is convincing because it combines theory and history with longevity studies in mice and yeast, and metabolic data from a new short-term trial in humans. The FMD (fasting-mimicking diet) is ketogenic, with restricted protein and a high percentage of calories from fat. “Day 1 of the diet supplies 1,090 kcal (10% protein, 56% fat, 34% carbohydrate), days 2–5 are identical in formulation and provide 725 kcal (9% protein, 44% fat, 47% carbohydrate).” The diet is predominantly fat. The closest single food that approximates these macronutrient ratios is the avocado. The diet approximates two avocados per day. But you could construct the same macronutrient ratios using rice or apples and adding vegetable oil or small quantities of nuts. I assume that green leafy vegetables could be added to the diet without changing its effect, while making it more palatable and filling and giving you a vehicle for the vegetable oil. Here are three sample menus of my own construction (don’t blame Longo), each designed to give you ⅓ of the FMD nutrients for Day 1 or ½ the nutrients for Days 2-5. Each recipe has about 360 calories. While these recipes mirror the macronutrient content of the FMD, they don’t have the same micronutrients, and they generally have a lot of extra leafy-green bulk (fiber). My recipes haven’t been studied in a clinical trial. Spice to taste–the effect on calories and macronutrients is negligible. Salt freely and supplement with magnesium. Mice were put on the FMD for 4 days, twice per month, starting when they were already middle-aged (16 months for mice ~ 50 years for humans). They lived 11% longer than control mice (median) though maximum life span was not increased. There was some indication that the mice were unable to tolerate the FMD intervals when they were really old, that it was triggering their death, and the experimental protocol was modified so that FMD intervals were stopped when the mice were 29 months old (the human equivalent of 90 years). Test mice fully compensated for the lost calories when they were returned to ad libitum feeding, but still they weighed less–same lean mass but less visceral fat. FMD mice had improved cognitive performance, stronger immune systems, lower markers of inflammation, and lower fasting blood sugar. When they died, it was less likely to be of lymphoma, which is what usually kills lab mice. Humans were on the FMD diet 5 days out of each month, in a preliminary test that ran for three months. Like the rodents, humans compensated for the lost calories when they returned to free eating, but still lost weight (not lean mass, but body fat). Blood sugar and markers of inflammation were down; fasting insulin and IGF-1 were lower. The article made no mention of HDL or LDL cholesterol. Longer term trials with more criteria for metabolic health are planned. In case you can’t tell, I’m really impressed with Longo’s work. I think he has advanced the practice of human nutrition in the last few years more than anything that has been done in decades. We already have, incidentally, a great deal of information about the benefits of metformin in people with Type 2 diabetes (T2D, or metabolic syndrome). It has been the first-line drug for T2D for fifty years, and about 150 million people are taking metformin worldwide. The huge numbers have made it easy to collect data on other diseases. People taking metformin have lower rates of cancer, heart disease and dementia than people taking other diabetic drugs. It is tempting to conclude that metformin forestalls the diseases of old age generally, but rates of all these diseases are already elevated in people with T2D. The new question being asked is whether metformin will offer benefits for people who don’t have diabetes to begin with. There is one Scottish study reporting that cancer rates for diabetics taking metformin are depressed below the rate for non-diabetics who don’t take metformin. Now that’s promising. Nature reported last week that FDA had scheduled a hearing on Wednesday past (6/24) to consider a proposed drug trial for metformin as an anti-aging remedy. The protocol would be to identify patients who have symptoms of one of three age-related disease: cardiovascular disease, cancer and dementia. People with T2D would be excluded by design. Subjects would be prescribed metformin or a placebo, and the researchers would look for an effect on the other two diseases. This design is a clever compromise between bureaucratic requirements and clean experimental methodology. The bureaucratic requirement is that people assigned to take the drug must already be diagnosed with a recognized disease. But it is the potential of metformin to reduce risk of the diseases that the subjects do not have that is the target question for the study. Barzilai already has a small, ongoing trial for metformin and aging registered at ClinicalTrials.gov. Just 15 patients will be enrolled, and the plan is to look at their gene expression profiles to see if metformin has an anti-aging effect. A growing number of researchers (including me) thinks that gene expression drives aging, and last year, Steve Horvath of UCLA published a protocol for measuring physical age of the human body by combining epigenetic markers (methylation) from hundreds of different chromosome sites that empirically appear most sensitive to age. They use the acronym MILES for Metformin In Longevity Study. The new study is far more ambitious. Plans call for the trial to enrol 3,000 people aged 70–80 years at roughly 15 centres around the United States. The trial will take 5–7 years and cost US$50 million, Barzilai estimates, although it does not yet have funding. That’s $17,000 per patient, for a drug that costs pennies. Certainly the cost will hold up this project, and monitoring patients for diseases that are already covered in their annual physicals. Why does it need to be so expensive? I have written to Barzilai about the Wednesday meeting with FDA and he would only say to watch for an article in next week’s Science magazine. The shortcut to modest gains in longevity is to work with the body’s adaptation to caloric restriction. CR is known to work in many different animals, and is known to offer health benefits in humans, (although human longevity studies are probably completely impractical). So the search is on for “CR mimetics”, drugs that will put the body into a calorie-deprived state without actually having to eat less. Intermittent fasting, the Longo diet, and metformin all work on the same pathway as CR. Some researchers believe resveratrol works on this same pathway, and even for rapamycin there is significant overlap with the CR mechanism. It is understandable that researchers should be investing their time and pharmaceutical companies their money in this area, because this is where returns on investment are surest. But the potential of this approach is limited to a few years of life extension, and layering metformin on CR on fasting on resveratrol on rapamycin will not add more years, just the same few years many times over. As I have said in previous columns, there is immediate potential in telomerase activation, and longer term my highest priority would be to understand the epigenetic changes that come with age. Would it work just as well to do one day a week which would be about four days a month? Or is there some magic in doing five consecutive days? I like the idea of a once-a-week fast. I fast from Wed dinner to Fri breakfast almost every week. But common sense and Longo’s research both suggest that something happens during longer fasts that goes beyond the benefits of repeated shorter fasts. The common sense part is that short fasts are just too easy. Heck, I fast 8 hours every night – I can do it in my sleep – and that adds up to 10 days a month! I hope Longo finds the dividing line soon… actually, the dream would be to have every biomarker graphed on the Y axis by hours on the X… including AFTER ending the fasting, so we can infer the optimum interval as well. Except that anti-oxidants have been shown to reduce (even nullify?) CR benefits. You might be right–I don’t know if this experiment has been done. But lettuce is not exactly a super-potent source of vitamins A, C and E.
> lettuce is not exactly a super-potent source of vitamins A, C and E.
How many calories per day would you suggest on this five day diet? 300 to 500 per day? Longo has an answer in his article. It’s about 1,000 calories on day 1 and 700 on days 2-5. As important as the calorie content is the fact that the calories are highly concentrated in fats, triggering ketosis. Would 700 calories a day be true or even close to fasting? Seems like a lot. I find this curious as well, specially the initial HIGHER (1K) intake. It’s not actually fasting, and his diet is not actually based on calories, though there’s a general (pretty generous) lid of 1,000 calories. It’s a type of protein cycling diet designed to mimic some of the effects of fasting (a “fasting-mimicking diet”). The key thing is that it works, as has been demonstrated in both human and animal studies. I agree it is similar to my keto diet (very low carb) with the exception that the protein is also kept to a very low level. Here are 2 tables from US 9386790B2 which describe diet in great detail. Longo actually said that a water fast (so ZERO Calories) should be the best but i’s too tough so….in case you can’t manage a water fating you shouldn’t consume more than 200 cal per day. I experienced a 10 days water fating with very good benefit so…5 days fasting is totally safe. Longo does say that water fasting would achieve the same thing, but he also clarified that doesn’t actually recommend water fasting unless done under a doctor’s supervision. I’ve read several articles and interview with him in which he expressed the opinion that they’re dangerous. His objective was to create a diet that would both be easy for people to adhere to for five days, while avoiding some of the problems associated with water fasts. Good this will help make it easier to get telomerase therapy approved if they allow longevity research. I admire Longo’s research and I believe he has given us a very powerful tool to win a few extra healthy years. However in terms of aging research I am a bit disappointed at Figure 5A. There is no life extension effect, healthspan only was increased (which is still great). But to my understanding his research has so far proved no more than that ad libitum feeding is detrimental to health especially in middle age, which we already know very well. What may be also interesting is why those mice started dieing at 26 month during or shortly after FMD. Was increased mortality caused by infections as a response to reduced WBC count? This would be easy to prevent in humans with antibiotics. Or is it because cardiac events? This is what I think might be the weakest point of the Longo fast and I think they should put more emphasis into ECG control of their subjects especially the aged ones and on the long term. Also I wonder how to map mouse years to human years. Now that we know that the epigenetic clock is stronger predictor of aging than telomere length. And there is a nice theory that DNA methyltransferases slowly replace Polycomb repressor complex as we age. PCR bound DNA is also silenced but in a reversible way as histones and not DNA itself gets methylated. As years pass by DNMT3 outcompetes PCR and DNA itslef gets methylated at CpG sites. I wonder if there is some research on the role of DNA methyltransferases and their knock down in mice. If I had to guess, I would guess that mice couldn’t survive without a methyltransferase gene. Yes, thats true. Thats why I suggested conditional knock down. Actually there is a lot of research in this area. Knockdown of DNMT3a in mouse HSCs causes malignancy. It has to do something with renewal vs differentiation. I got the impression that counter-intuitively it is expression of renewal genes that associates with aging and cancer. I am currently researching DNAm and I have never been more convinced it is a second cellular aging clock. If Methylation could be restored combined with Telomere restoration I think we would see very robust rejuvenation. Question is how do we re-methylate the cell especially the dangerous CpG sites which can promote Cancer in adulthood? I suspect Plasma as Dr Katcher suggests would be one such way to bypass the intricacy of the methyltransferase system. I believe epigenetic clock is the aging clock 🙂 But thats just a belief. Look up the Japanese study in 2015 on glycine an mitochondrial respiration. Confirms your belief. Telomere attrition and changing gene expression from TPE plus DNAm changes are likely big players in Stem cells wearing out. Personally I share the same opinion Josh has that Epigenetic changes are an aging clock. I think they work in conjunction with Telomeres to pretty much dictate cell age and gene expression. I believe (and am working to prove) this is the case so the two can be combined into a dual therapy. I’ve been thinking about your posts on “young blood”. If custom blood matures, we might not even need donors of young blood once the signalling is perfected. We could just use stem cells – if we could figure out how to get the signaling right. Chris I have had the same thought, however it depends what the factor is that programmes DNAm changes. As I understand it, If that factor is not expressed by the blood stem cells then it will not work. Examples of this are specialized cells like the Endocrine system which secrete hormones and the blood transports it around the body signalling the other cells. But the obvious solution is to reprogram the Stem cells so they act young system wide then there is no need for plasma at all. You would have to replace populations of Stem cells from time to time as mutations and natural decline occur but in theory you could get a lot of mileage out of resetting the gene expression in stem cells. The big question for me is, the DNA Methylation patterns are they the second aging clock in the cell and if so how can we reset it reliably? Young Plasma could well be resetting half the gene expression (eg, DNAm and Histone) and Telomerase could be resetting the other half with the Telomeres. We have seen longevity and health gains from using both techniques so what happens when they are combined? Tonight I’m on the second day of my 14th monthly fast. I was motivated by Valter Long’s June paper of last year that suggested “rejuvenation” of the immune system in old mice by several cycles of prolonged fasts Iasting 72 hours. (very severe for mice). Longo also stated that preliminary evidence in aged humans indicated a similar response. Longo speculated that other tissues would show similar effects. I found Longo’s patent on prolonged fasting and Fast Mimicking Diets online. It provided details on the diet and the changes that should occur if the FMD is capturing the benifits of water fasts, i.e., major drops in serum glucose, IGF, and PKA activity. I also read Longo’s recommendation that 4 to 5 days is a minimum for humans. Also men may require a day more than women to see the same benefit. The diet first reduces available protein and depletes liver glycogen reserves. So the first day is only a moderately restricted diet which wont discourage those who eat as much from habit as from hunger but does lead the body into a protein and liver glycogen depleted state. The next four days are more restrictive, designed to replicate the serum glucose level, IGF, and PKA activity drops seen in a water fast. (From my reading of Longo’s recent paper, the mice on the 4 day FMD had response’s very similar to mice on a 3 day water fast but the FMD was less stressful, important since that stress appeared to be correlated with early mouse death. In humans the response to FMD was more modest with serum glucose levels and IGF dropping more modestly, perhaps because 5 days of FMD is just not as stressful to humans as a 4 day FMD is for a mouse. Based on my internet research I experimented with a variety of FMDs and fasting lengths (5 days up to 10) for the first 6 months. After that I decided to stick with a simple 5 day water fast (I add lite salt to green tea extract after the second day) and not obsess over what I’m eating or not eating. Five days is short enough that my digestive system doesn’t shut down so refeeding doesn’t cause discomfort. By day 4 or 5 I’m typically wiped out physically and mentally. After 6 months I also began daily Intermittent Fasting, doing all my eating in one 5 to 7 hour period. Combining the IF with the monthly fast caused me to go into ketosis by the middle of the first day on the fast (I’m probably going in and out of mild ketosis daily during my IF only periods.). The fast is harder when combined with IF. I take B12, folic acid, vitamin D, a baby aspirin, lithium, green tea extract, melatonin, and resveratrol every day. During the last days of my monthly fast I also take 500 mg of quercetin in the morning and evening in the hope that it will help eliminate senescent epithelial cells and MSCs which I hope are already under stress due to the fast. When not fasting I eat a healthy diet including mackeral, salmon, pinto beans, peanuts, olive oil, uncooked rolled oats, turmeric, spinach, broccoli, cabbage, onions, carrots, a small apple, and 5 oz. of red wine (I have the Rs708272(T;T) gene variant which when combined with moderate alcohol is highly protective against coronary and heart disease.). I don’t smoke or drink (other than my daily glass of wine). At 62 I’m healthy, lean, and moderately athletic and have been my all my life. I get plenty of sleep, avoid stress, and keep healthy regular habits. My heart beat is slow (likely due to endurance training in my thirties) and my blood pressure is low normal. I seldom catch colds or other infections. My hair is thinning and over the last five years white hairs have begun replacing my customary blonde/brown. That is my most visible outer sign of aging. Internally I’ve lost muscle mass, strength, power, and energy over the last decade. Have I seen results? My major interest in Longo’s research was the activation of quiescent stem cells for tissue regeneration by prolonged fasting. (Longo’s research also showed no decline in HSC regeneration capacity due to the cycles of prolonged fasting.) Longo’s recent paper shows increased blood progenitor cells and more MSCs in mice eating a FMD. My expectation was that like the mice my immune system would “rejuvenate”. I haven’t been sick so that’s good but I’m primarily trusting Longo’s research will apply to me as well as to mice. More optimistically I am hoping that Longo is correct that other tissues will also “rejuvenate”. If so I’d expect to see improvement in tissues that turn over relatively quickly, e.g., hair and skin. I have noticed that the scraggly white hairs that had appeared on my chest are now light blonde and thicker. However, when I let my beard grow out, my chin hairs are still white. I haven’t noticed any changes in my skin, i.e., elasticity, thickness, and aging spots look about the same. I don’t expect direct improvement due to tissue regeneration in slow turnover tissues such as brain, heart, and skeletal muscle.but I thought there might be systemic effects in which beneficial substances produced in one tissue would have good effects in others (as is the case with exercise, hormesis, and parabiosis). After 13 months I haven’t noticed any major differences. I’m a slightly stronger and have better endurance but that could be due to increased focus on my training. Even if there is no systemic rejuvenation or extension of maximum lifespan there is strong evidence for increased health span. I plan to continue with monthly fasts and daily IF and live a healthy life longer even if there is no rejuvenation. Thanks for pioneering some practices that require extreme discipline, and thanks for your clear and thorough reporting. I hope we continue to learn from each others’ experience. Note that the URL is continuous, meaning that there is no space between any of the characters in the URL. Thanks for the link to Longo’s latest patent filing. I regularly search for new info on intermittent fasting and prolonged fasting. I’m especially looking for info on supplements that might interfere with the benefits of fasting, e.g., NAC, or might increase the benefits, e.g., resveratrol or quercetin. Owen – Early in my self experimentation, I adopted the idea that if I ate a typical or Standard American Diet (SAD), I would eventually (and early in my life) get the typical Americans diseases (cancer, heart disease, high blood pressure, diabetes and more recently Alzheimer’s). To diverge from the SAD diet, one can either add things or limit and subtract things. I do not typically add things (supplement) with the intention of enhancing my fasts. However, I am now starting to take foods out of my diet to enhance my fasts. First, I am not a medical person or trained in nutrition. My undergraduate degree is in Materials Engineering. I am just a self experimenter. But, I like to think of myself as “standing on the shoulder of giants”. I will name a few of those giants as I go on with my rant. I eat a ketogenic diet everyday. So the subtraction from my diet is carbs. My recollection is that Dr. Longo thinks that a good fast has to be long enough to put the person into ketosis; hence 4-5 days is his fasting period. Two experts and researchers in the field of ketogenic diets are Steve Phinney and Jeff Volek. They state it takes 2-4 weeks or longer to get into ketosis. Their books are sold at Amazon and their lectures are free at YouTube.com. Whether it takes 4 days or 4 weeks to get into ketosis, it is immaterial to me because I am in ketosis from the very start (day zero). Watch Phinney’s lectures first, he is more dynamic than Volek. The latest twist to my diet is to drastically reduce the amount of foods that I eat that contain methionine (MetR). The rub here is that it means I am taking most animal products out of my diet. I take a tablespoon or 2 of cod liver oil and thus will technically never be a vegetarian. I may have to start taking B-12 and a multimineral. Dr. Longo’s comments ( in the link below) indicates that we should be restricting the amount of protein that we eat in midlife. But in his patent disclosure, he uses diets that are not only generally low protein but that are also specifically very low in methionine. I think that the combination of MetR and ketosis are the key to his fasting diet. I use one of the free apps online to monitor the composition of my food. The app that I have used for years is at http://www.cronometer.com. They make their $ from advertisers so I click on the hotlinks from time to time. I have used it for years to monitor my consumption of carbs, proteins and fiber; now I also focus on monitoring my methionine intake. It have been shown since 70th years of the 20th century that antidiabetic biguanides (phenformin, buformin , metformin ) slow down aging, increase life span and prevent spontaneous and induced by chemicals, ionizing radiation, viruses or transgenes carcinogenesis in non-diabetic rodents in a huge number of models. The effect of biguanides on aging was more sufficient if the treatment started soon after puberty. I believe that clinical trials should include cohorts starting intake of metformin at the age of 30-35 years, 45-50 years and 70-75 years. Thank you for commenting here. I know of your work on metformin, melatonin, epitalon, and other substances, and I am working to help make it better known in the West. I am on a low carb calorie restriction diet accompanied with regular physical exercise. I have no restriction on fats and proteins but the calorie balance is negative (10-20%) because of physical exercise . Don’t you think that’s much better than just to restrict calories ? It appears that a lot of the current CR researchers favor a plant based diet as one that is healthiest. I am referring only to calorie balance. I have argued that calorie balance is not the whole story of weight management. I am not interested in weight management (I have 12 % body fat , BMI 25 and fasting glucose 85 mg/dL regular). From the point of view of health which is better. I think I read that unless the calorie restriction is severe, not eating the calories in the first place works better than eating more and burning that added amount off. It was probably something Roy Walford showed. I forget where i read it. Much as I am grateful to Walford for laying foundations of longevity science, there are a number of things he got wrong, including the “120-year diet”. People are not mice, and I am not you. Prolonged fasting is different from CR. If I am not mistaken Longo said after the 2014 paper that with a few PF cycles you can get markers that only show up after half a year of CR. PF is not about calories its about suppressing insulin and IGF1 signalling in your cells long enough that your cells start some really good, rejuvenation like process . CR does not do that. IGF1 signalling is dependent on essential amino acids and calories. So with protein rich CR you cannot suppress IGF1 signalling. Thus low carb diet maybe good at preventing cardiovascular disease, PF may be good at preventing cancer too (derived from mouse studies) and also good for CV (at least lowered CRP in human studies suggests so). I prefer do to a lot of intense physical activity instead of fasting. 1. Is it better to water fast or use a FMD, supposing one could go without eating? 2. Are the parts of the FMD that are not fat required, or would it be better to consume the FMD as designed? 3. Are the calories amount in the FMD important, or is less more? 4. If one had problems going 5 days without food, could a straight water fast be combined with and FMD to get to the 5 day goal? 5. If a combination of the fasting would work, would it be better to start with a water fast or start with the FMD? 6. Would it work to alternate between pure water fasting and an FMD, as needed to get through the 5 days? I am happy to provide answers, but you must promise to take them with a healthy dose of salt. This is a new field, and studies with the variants that you suggest have not yet been done yet. You might refer these questions directly to Dr Longo. He is professor at University of Southern California, and his email address is public. Of course, his experience is the widest, and he has hunches that he will not publish until they are proved. Occasionally, he is willing to share some of those hunches privately. If you learn anything from him, I hope you will post it on this comment page. Another person you might reach out to is Mark Mattson at NIH in Baltimore. He has studied intermittent fasting in people, and has written on the subject. The FMD was developed as a compromise, to deliver most of the benefits of a complete water fast, but with less pain and suffering. Fasting scares people, and the FMD is something more people might be brave enough to try. Some people get headaches when they fast, and almost everyone loses energy and finds it hard to concentrate and be productive during the first few days. So if you can tolerate the full 5-day fast, that’s probably the most effective. Skipping some of the meals is certainly not going to make the program less effective, but it might make it harder for you to stick to it and come back again next month. If you want to skip eating entirely some of the 5 days, that can only increase the benefit. 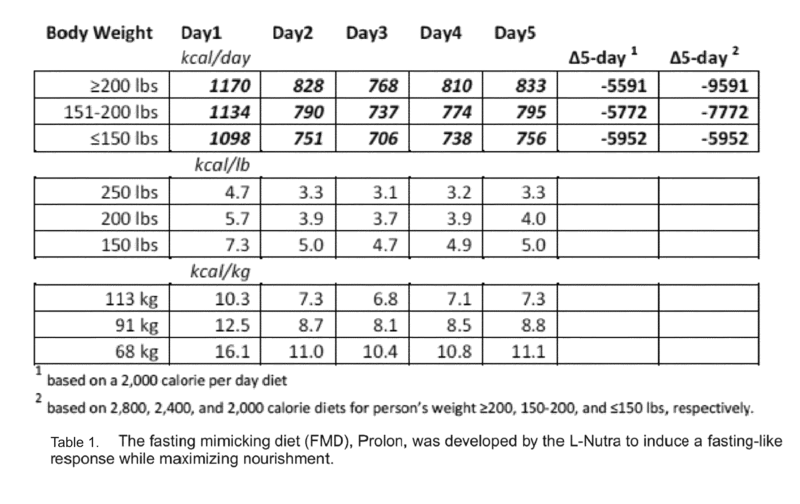 My hunch is that in mixing FMD with full fasting, it would be better for you to have the full fast days toward the end. 1. Is eating all fat better than eating the FMD with its carbs and protein? 2. If one was eating all fat, could one eat as much fat as they wanted and still be considered to be on a FMD? Is it the calorie reduction that makes fasting valuable or lack of something else? I agree that salt is healthier than some authorities say. See Melvin Kendrick blogs. I think that science has yet to answer these questions, and we have to rely on hints and inferences. For the long-term, protein restriction has some of the same benefits as calorie restriction, but it is not as effective. This comes from studies of animals, not humans, and mostly rodents. Protein restriction in mice is done with a carb-rich diet. Mice don’t live as long if they are fed a high fat diet. We don’t know if the same is true for people, and we don’t know if short term the results will be the same as long term. blood sugar levels. Also, I had a resting metabolic rate test and my calories were 1683, but the test reported an rq (respitorary quotient rate) of .98 glucose (meaning I don’t burn enough fat as normal population). Do you have any thoughts on how to burn more fat? I do exercise and eat less calories than 1683/day. Thank you so much! I find a low-carb diet works for me, and that’s what I recommend. I note that others have success with a low protein diet which, paradoxically, can also combat insulin resistance. More information from my blog is here. There are more suggestions at AgingAdvice.org. Here is a link to an interview with Dr. Longo. The interview starts after about 7:30 into the link. On an everyday basis, Longo eats breakfast and diner. He mentions that the 5 day fast knock out about 30% of the immune system ( the weakest 30%). This suggests that 3-4 cycles should get a complete reset of the immune system. 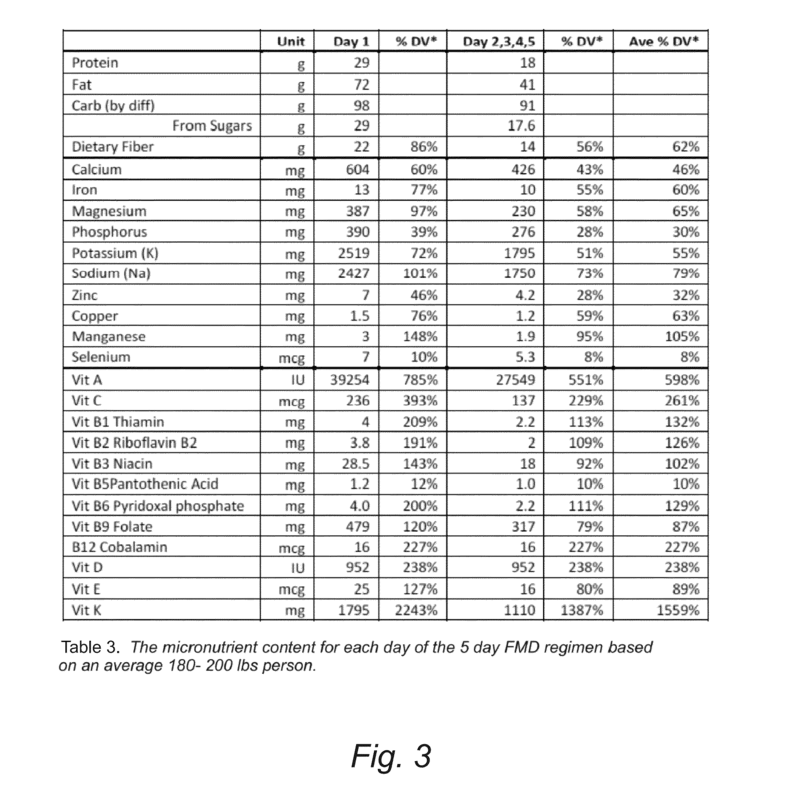 I was reading Dr Longo’s patent publication US 20100004309 dated May 14, 2015 and entitled “Dietary Compositions and Methods for Protection Against Chemotherapy, Radiotherapy, Oxidative Stress, and Aging”. I noticed that claim 1 of the document includes the limitation “0-0.2% (by weight) L-methionine”. Apparently, Longo is using a Methionine restriction (MetR) as a feature of his Fast Mimicking Diet (FMD). Or just google the name of the paper in quotations. It is nice when more than one team of experts start to converge on a similar strategy. It makes the strategy more convincing. Each of the videos has a “Sources cited” hotlink. At first we thought it was basically a fruit&veggies diet. But when we put it together we determined not only is it an enormous amount of food, but it completely neglected fat content (we were around 10% calories from fat instead of 44%). The end result was that we needed to cut down food volume approximately 40-50% and replace it with high-fat components — primarily olive oil, avocado, coconut milk. Our biggest pleasure was discovering how well coconut milk fits into this diet, since we adore Thai curries and using lots of coconut milk makes the ratios work out perfectly. Also the curry paste gives it quite a bit of spiciness which increase satiety. Basically just mix everything except the rice and veggies over heat until it’s smooth. Then throw in veggies and cook until soft. Serve with the 1/4 cup cooked rice. This makes four meals of approx 330 calories each (including rice) with a 44%/46%/10% ratio — almost perfect. And you’ll feel satiated from one serving. (Note that it’s fairly spicy, you can use less paste or add water to reduce spiciness). Feel free to try with different vegetables and different curry pastes (Red, Panang, Green, Masaman, etc). Another thing that worked out well was eating 8 oz of guacamole with two cups raw vegetables for dipping. If you’re aiming for 2x 360 calorie meals per day, this works out nicely as it gives you about 310 calories slightly high on fat, giving you 50 calories worth of veggies you can eat as a snack when you get hungry at some point the same day. Although I understand the high-fat content of FMD is for physiological reasons, it opens up a lot of really delicious and satisfying meals that have made FMD a lot more pleasant than we expected (we’ve never done any kind of diet or fasting before). You’ll still be hungry, but at least you’ll enjoy your meals and feel satiated by them. If we had simply continued our normal diet but cutting calories by 70% we would’ve been absolutely miserable. Thanks for the recipe, Alan – I mean to try it soon. My own FMD recipe page is up and running now at http://AgingAdvice.org/FMD-recipes.html. With your permission, I will add your recipe to it. By all means add it to your list. I’d be happy to share more of the recipes we’ve been coming up with (or my magic spreadsheet I’ve been using for planning our FMD schedule). As mentioned, I was quite scared of this diet, but having good FMD recipes makes a big difference. I’ll check out some of the other ones you’ve already posted. Thanks. You have a good point. “One-size-fits-all” rarely works. Certainly it makes sense to modify the program based on many individual characteristics, and this makes the program a lot more complicated. But you are right that the first and easiest modification would be to scale it according to height and weight. My impression is that the diet is designed to give you a certain lower bound amount of fat and carbs (and as little protein as possible) as your body needs to continue to function properly. In this regard, there might be some scaling effects based on your normal calorie intake, but I wouldn’t be surprised if most “normal” bodies had a similar lower-bound. My wife and I have done this diet twice and preparing for a third month. It is very important to follow the calorie ratios, and makes the diet completely tolerable. In order to keep the fat content high and protein low, you end up using a lot of olive oil, avocado, and especially in our case, coconut milk. We probably eat thai vegetable curries half of the week loaded with coconut milk and a tiny bit of rice. You’d be surprised how much vegetables (in terms of volume) it takes to get to 150 calories — we’re usually full after those meals! Honestly, if we had simply cut our normal diet down to 1/3 or 1/4 without any regards for calorie ratios, it would be a disaster. We would be suffering all week and probably not make it through. However, with the meals calibrated properly (combined with appropriate expectations) we really only felt uncomfortably hungry the last two nights before bed, and that wasn’t even so bad. Even for me at 190 pounds and moderate activity levels. Though I would recommend you don’t expect to exercise during those five days. Especially with the minimal protein content, your body would have a tough time recovering. FYI — We are about to start our third month of this diet, and I’m still 9 lbs less than the day we started the first month. I conveniently have a blood test scheduled for two weeks after the end of our third month, and had one a week before the first diet (that’s just coincidence, btw, I had slightly high cholesterol and something else, they wanted me to make some changes and come back). I’m looking forward to adding an informal datapoint to this discussion. Personally, I have now done the FMD 3 times, about 5 days out of the month, with minimal disruption and discomfort. I have also done the 4-day full fast twice this year and three times the previous year. Full fast cuts back on my productivity and affects my mood and attention in ways that are not wholly negative, but noticeable and different. I’d suggest you start a little lower than that, and see how it feels. The whole idea is to find a point at which you get the benefits of fasting without the disruption and discomfort. My guess is that the individual variation will be just as substantial as the predictable adjustment due to height and weight and activity level. I too recommend you start lower. I am 190 lbs and believe I consume 2,500-2,700 calories per day on average, yet I survived 1090+725+725+725+725 with minimal discomfort. In fact, my wife and I were amazed that we felt so good without cheating at all. The second month we had a little discomfort, but not even enough consider cheating, much less stopping the diet. But as I said, pay close attention to the ratios. We found that if we just targeted about 45% worth of fat (oil, coconut milk), and 55% in vegetables, you’d hit the protein target dead on. So for instance, for 360 calories, I’d say aim for about 160 calories from olive oil and other fats, and 200 calories from vegetables. As I said before 200 calories of vegetables is actually a ton of food. And the fat keeps you full for a while. I recommend you try it as prescribed, and adjust it the second time if you have a lot of trouble with it the first time. I guess my biggest fear is the low calorie intake interfering very negatively with work and exercise. But all in all its only for five days. I reckon that I will give it a go next week. I tried the FMD in early October and found it pretty easy. Had to spend time creating meals that matched the macro nutrient proportions. When that was done I ate the same thing for the 725 days. The first day of 1090 cals was an expanded version of 725. Very simple menu with greens & avocado salads or wrap, oatmeal breakfast and getting the % close w/o being obsessive. Definitely felt alert and enough energy to do all regular activities. I am not a lover of fasting but this worked. Going to do it a second time now a month later. Going for the longevity benefits and a little weight loss boost/re-boot! KC, I am keenly interested in trying the FMD. Could you please be more specific about your meal plan, describing exactly what you ate and the proportions? How much salad, avocado, etc. Did you use dressing? How much oatmeal? What kind of wrap? Did you eat dinner? I would very much appreciate this information! Thanks. My page, with recipes for FMD prepared by Enid Kassner, is here. I’ve done a couple of 30+ day water fasts in my life and I look ten years younger when I’m done…the effects last a couple of years too. Now I’ve done a zillion short fasts…3 days, 5 days, 10 days, 14 days, and they don’t have near the miraculous effect of a long 30+ day fast. Since the article is behind a paywall, I wonder if you would enlighten us as to the different effects of water vs. FMD? IGF-1, glucose, etc. If significantly different, I could handle a 5-day water fast. I find it worrying that Longo has not yet published on the human trials. I am worried that the results are negative or inconclusive so he would not publish them. I have done the fasting mimicking diet now 5 times (mostly using recipes from this site) with decent results and my husband with excellent results. Recently I read a couple of articles where they said you cannot have any coffee or other caffeinated drinks. Does anyone know if this is true? I have probably upped my caffeine (black coffee or plain green tea) intake a lot while on the diet. I would be willing to try and forgo the caffeine but it might be a deal breaker for my husband. Where did you hear that? I had the impression that Longo’s original FMD includes caffeine, but I haven’t confirmed that. FYI – None of the Longo’s patent publications contain the word caffeine. Hello, if you read the patent details of Longo’s Prolon FMD diet , you can read high percentage dose for Vitamin D and vitamina B12. This imply , I think, that if you want to try FMD following the recipes provided kindly by Josh , you need supplement in these vitamins? From the patent below the amounts are “16-25 mcg Vitamin B12” and “600-1000 IU of Vitamin D per day ” . I do not consider these amount to require supplementation. Bello david, i didn’t check it, but I think it is very difficult to satisfy the amount of b12 and D with the plant based recipes provided by Josh, b12 is only in animal foods. And in any case being the daily amount of calorie so reduced would be difficult also is you would eat meat or fish, don’t you think so? Can one consume coffee while on ProLon®? Because coffee can interfere with the beneficial effects of the diet, it is not recommended to be consumed with ProLon®. However, if one must have coffee, we recommend minimizing coffee consumption to 1 cup per day. Can one substitute different flavors of tea while on ProLon®? There are different flavors of teas provided with the diet. Although not recommended, since the ProLon® teas are selected for specific properties and have been clinically tested, if for some reason one does not want to consume one of these flavors, a substitution can be made. A substitute tea should have no caffeine or additives, and should be taken without sugar or cream. TREATMENT OF DIABETES” in figure 3 you can find that for example Vitamin K is supplied for 2243% DV at Day 1 and 1559% DV at Day 2-5. If you consider the recipes “Saag Aloo (Indian spianch with potatoes) and “Sesame Noodles with Bok Choy” they together bring about 500 % DV of Vitamin K.
So I am asking if we could make one step closer also looking to micronutrients…. The Australian Broadcasting Company did a show on this where the host underwent the FMD and Longo takes blood samples before and after and then discusses the results. If you’re interested the link is here. I read that the benefits of fasting are not the same for women of childbearing age and that the effects could actually be negative. Any advice? ‘re metformin. What about the reports of it causing early dementia and muscle pain? I was prescribed Metformin in 2004. In 2006, after reading Googled 1994 research on Metformin and how it destroys the bodies ability to make/use B12, I asked my endocrinologist to test my levels. He was most indignant “you’re not anaemic” which is conventional thinking and teaching. My levels were almost zero, well below the minimum RDA which are now considered too low anyway . After several hospitalizations with arrythmia and flutter, I have been clear for three years since stoping Metformin and regular B12 injections. B12 deficiency is definitely a risk. That’s why supplementation is always recommended when taking Metformin. 1. Given that huge swaths of the population are insulin resistant and pre-diabetic, Metformin should be prescribed much more often than it is today. 2. 70% of CHD is a byproduct of insulin resistance and metabolic syndrome. Hence the protection Metformin confers not just against cancer, but also CHD. 3. Consequently much premature aging and death is due to insulin related metabolic disturbances (no doubt aggravated by the modern high-carb diet and lack of exercise). 4. A Metformin study if the type described with already ill 70+ year olds is probably a case of too little too late. Scientific tests back in ’94 (ish) showed that Metformin destroyed the bodies ability to produce vitamin 12 in 17% of the test population. I am one of those 17% and now am required to have quarterly injections of B12. Metformin has other side effects, of which we hear very little. Love the blog Josh! Not sure how it took me so long to find it after years of semi-obsessive reading about anti aging. I’ve been doing IF since early 2011 95%+ of the time in a daily 16/8 hour format all the way up to a 22/2 format, with the occasional 24 hour fast arising organically. I originally got interesting in it for easier fat loss (I’m a long time powerlifter) but got sold by the somatic and cognitive benefits, particularly in the morning as I usually begin eating between 12pm-2pm. I simply feel great, energetic and am razor sharp mentally most mornings. It’s almost a disappointment when I finally have to eat, which is how the fast naturally extends to 18 hours plus quite often. To anyone considering this approach, I would encourage you to give it a shot. It’s easy, means bigger more satisfying meals (albeit less frequently) and has a host of immediately noticeable benefits. It’s really only the first few days that are a bit challenging. Once your ghrelin resets to the new schedule, you hardly even think about food until the eating window. The diet ratios with carbohydrate percentages in the 40% range are not ketogenic. Prof Longo has said in other interviews that he does not think a ketogenic diet as a normal diet is healthy. From what I understand, iirc, CR works even outside the parameters that can ever be found in nature. That is IIRC, even up to 65% restriction resulted in 65% increase in lifespan in mice. It is extremely unlikely, virtually impossible, that on 65% restriction on a famine you will find extraordinarily micronutrient fortified food with minimal effort(as large effort will also result in death from excessive calorie burning from activity) as provided in the lab. I’ve also heard that on CR started on adult organisms, the transition into CR needs to be gradual and not sudden to actually confer benefits. The food also has to be fortified to provide sufficient micronutrients. Again it would seem to be that famines might occur quite sudden and drastic, and may reduce micronutrient availability. Even in the lab it may be that the mechanism could even go further if not for the low calories compromising vital functions. On higher lifeforms like man the minimal calories necessary to not jeopardize function may be even higher(I’ve heard of some severe calorie restriction individuals losing bone integrity), but the genetic expression flexibility may still remain. What will tell the true limits of these pathways are the physical limits in terms of gene expression that they can ever reach with interventions such as drugs or nutraceuticals. Which may be reached at 65% CR or could be higher had it been physically possible to survive on even less calories. CR mimetics stimulate the pathways without jeopardizing function from insufficient calories. We now know that things like NAD+ drop with age in some organisms which may be behind why resveratrol failed on healthy organism with longer lifespans of a few years after succeeding in many organisms of lower lifespans such as yeast, c. elegans, fruit flies, and some short lived fishes. Sirtuin dependence on NAD+ would obviously be compromised if NAD+ levels fall too low. Since resveratrol works in part through sirtuins it’s effects would be adversely affected through such age associated changes. But ways to increase NAD+ are now known, some readily available some on the horizon.